It’s rather ironic, I suppose, that I’ve been making the case here for 12 days that the Bible’s Book of Revelation is, at bottom, a book about hope; a book about God’s triumph of love over evil; a book that amplifies (albeit it in a strange way) the good news of Jesus Christ. As I posted on my Facebook page today: What a different America and different world this would be if all Americans who profess to know Jesus opened themselves up and let the love and grace of God rule their hearts to the fullest. With the recent cold-blooded murder of a pop singer and today’s slaughter of unsuspecting people in a gay bar in Orlando, Fla.–the home of Disney World–I can understand how someone might think that putting one’s trust in the promises of God is as foolish as trusting in the always happy Mickey Mouse. With all the blood and tears flowing in such a great American city on this Sunday, it’s understandable that even many Christians are feeling pessimistic about the future of America and the world. 1. Christian hope isn’t about optimism or pessimism. The Bible–least of all Revelation–doesn’t give a vision of happy, easy optimism. It gives reason for hope in the Christ who rose in the Resurrection Event that shook even the evil forces of the world. 2. Blood and tears borne out of violence are flowing every hour of every day in violent-prone places around the world, including–God bless her–America. I do not mean to diminish the pain and hurt that the people in Orlando are suffering at this moment by pointing out that the blood and tears flowing in so many streets in Chicago every day don’t get the wall-to-wall media coverage that Orlando is getting and will continue to get. 3. The Bible is a reminder that violence is an old, old story. Blood and tears borne out of violence have been flowing every hour of the every day in this broken, violent-prone world since a certain misguided character committed the first murder. He killed his own blood brother, for God’s sake. It seems that violence springs eternal. But then there’s hope and you know what they say about it and how it springs. Revelation as much as any other book in the Bible calls us to the work of healing and liberation, bridging the gaps of division in all their forms, be they subtle or insanely violent. God will make things right in “the end,” but that doesn’t mean we can sit on our hands and watch the violent, unjust world go by, doing nothing to make it more just and peaceful. We’re called to be responsive to God, to be in partnership with God in our hearts and words and deeds, until the day God’s promises are fulfilled to the fullest. 12. Hope in the promise of God’s glory is not misplaced when we see God’s people working in such a seemingly hopeless world for the liberation and freedom of all people and for liberty and justice for all, regardless of religion, race, sexual orientation, gender or any other identify. Reverend, I appreciate your willingness to address the fact that violence is something that, it would seem, is part of human existence. 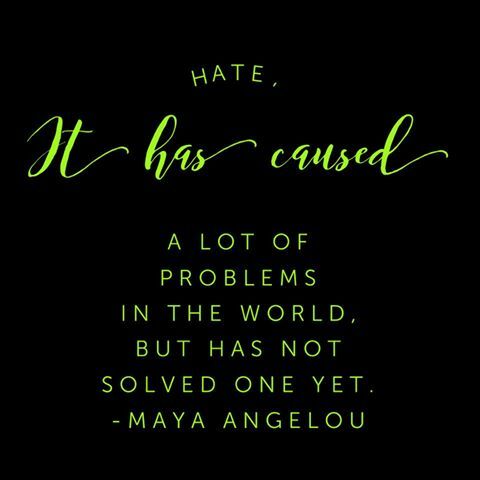 While I understand the need of some to toss out platitudes such as “to battle hate, embrace love” during trying times, it fails to address the fact that there are those who are not interested in embracing love under any circumstances. It simply doesn’t serve their purposes. There are billions of people on this planet full of kindness, faith and understanding; those who inflict harm rarely do so because they are unaware of other options. To believe that we can, figuratively speaking, hold hands and win over the hearts of those with nefarious intent is not only simplistic, but dangerous. I don’t have the answer, and I don’t think we should target any group simply because of their religion, nationality, etc. But I do tire of the mentality that believes all we need to do to stop evil is be more compassionate, understanding, etc. I don’t disagree with you, Boll. I’ve often written here that I’m an “almost pacifist.” I’ve often noted that even MLK JR. said that a violent lunatic running through the village has to be stopped. War is a necessary evil sometimes, but it’s still an evil and we throw ourselves at the mercy of God when we use violent force. My concern is people who misuse or misinterpret the Bible to make the will of God or Jesus to be violent conquest. That’s how they got to the Crusades and that’s how we’ve gotten into so many costly wars and conflicts in which nobody “wins” anything, much less makes the world any safer. I don’t know what the answer is either, but we can sow little seeds of peace and good will where we can in our daily lives with people who are “different” from us in race, etc. Indeed, actions do speak loudly when it comes to sowing seeds of peace and good will. I, like you, would rather we not have to use force. And I, like you, am not naïve enough to believe that wishing it so will make it happen. If that were the case, we would have had peace a long, long time ago. Yes, some will always find a way to use religion to justify actions. Personally, I don’t pretend to have any insight into God’s plan. But we’re I to fathom a guess, random murder and mayhem probably isn’t on the list, however. And by “violent conquest” I’m thinking of building a ruling empire in order to rule the world with militarism. But that’s a whole other blog post for another day. Good to hear from you always.